So since it is … you know… 100 degrees outside I haven’t been baking a whole lot. When I do though, it has been solid recipes I know the kids love like the Chocolate Chocolate Chip Zucchini Muffins. Back to the regularly schedule and sober program…. This meal comes together in 30 minutes. The kids ate everything that wasn’t green and the hubby liked it. So I’ll give it a successful 2 thumbs up. 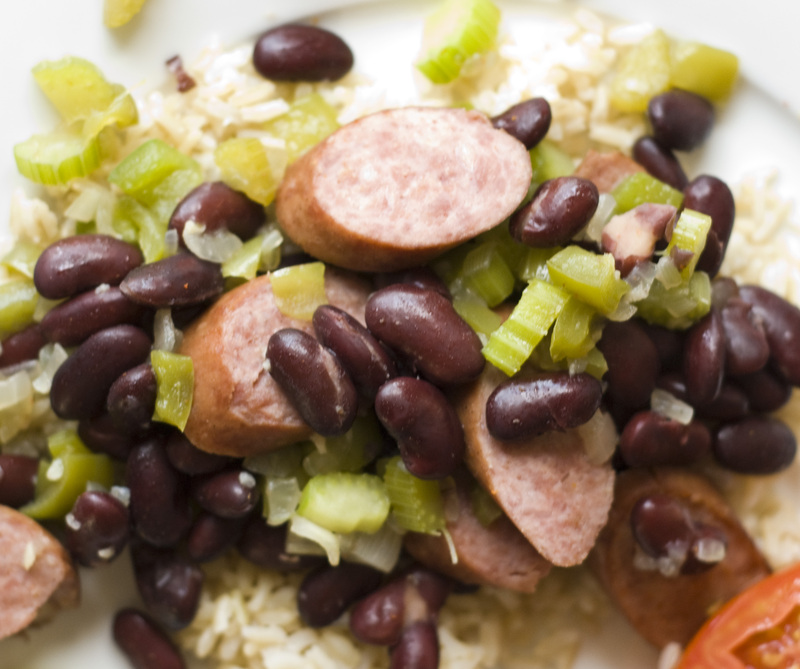 The fiber and protein from the beans, the health benefits of the veggies and lean protein of using chicken or turkey sausage with whole grain rice makes this meal really nutritious and filling. 1. In a big 12″ or larger skillet, add the oil and heat to medium heat. Once hot, add your sausage and brown a few minutes. 2. Dump in your celery, onion, bell pepper and garlic. Cook that for another 5 minutes or so – until the veggies are soft. 3. Dump in the water, bay leaves, cayenne, and beans. Simmer covered for 20 minutes. 4. Unless you like to eat bay leaves, take those out and serve over rice. I had to use a slotted spoon because of the water still at the bottom of the pan. It was still yummy.